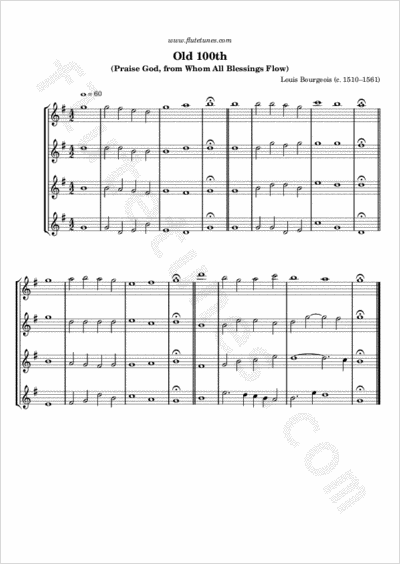 “Old Hundredth” is a hymn tune from the 1551 edition of the Genevan Psalter, Pseaumes Octante Trois de David, and is one of the best known melodies in all Christian musical traditions. The tune is usually attributed to the French composer Loys “Louis” Bourgeois. Although the tune was first associated with Psalm 134 in the Genevan Psalter, the melody receives its current name from an association with the 100th Psalm, and is commonly sung with diverse other lyrics as well. A hymn commonly sung to Old 100th is Thomas Ken's “Praise God, from Whom All Blessings Flow”, often known simply as “The Doxology”.